Fabian Walters is a partner with McKennon Shelton & Henn LLP with a practice focusing on corporate and securities law, public finance, equipment leasing and blue sky laws. 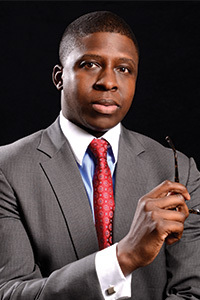 In Fabian’s public finance practice, he serves as bond counsel, underwriter's counsel, and issuer's counsel in connection with fixed and variable rate bonds, tax increment and special taxing district bonds, bonds supported by letters of credit and bond insurance, public issues, private placements, bank-qualified bonds, and taxable bonds financings. Fabian also represents companies of all sizes and maturity in industries such as transportation, health care, technology, real estate, finance, retail and faith based organizations. Much of Fabian’s corporate practice focuses on complex business transactions and negotiating and drafting contracts, as well as drafting company polices. Fabian provides counsel on a full spectrum of business issues including entity formation and private financing, shareholder agreements, labor disputes, equipment purchases and leasing. Fabian is a member of the Maryland bar. Education: American University, Kogod School of Business, M.B.A.; American University, Washington College of Law, J.D. ; Hampton University, B.S.